Giant animals are quite common in science fiction, including King Kong, Godzilla, many different kinds of gigantic insects and plenty of truly huge sea monsters. Are there such things as giant animals in real life? The simple answer is yes, because some giant animals have already been discovered and officially recognized by mainstream science. So far, none of these can kick over a skyscraper or swallow an oil tanker whole, but they still boast impressive sizes for the type of animal they are. Whether an animal is considered a giant or not depends on what size we expect it to be. We would not be impressed with the size of a 5-foot-long cow, but a 5-foot-long frog would be a true giant. Official recognition has already happened with a number of giant animals once considered highly unlikely to exist, such as the kraken, some types of giant hog and some kinds of giant shark. Other giant animals remain undiscovered. These are still in the domain of cryptozoology, awaiting the day when enough evidence could bring them fully into the realm of ordinary biology, converting them from legendary monsters to known creatures that are simply large animals. From fossil evidence, we know that a great variety of truly large animals once existed, with no corner of the globe lacking in examples. In particular, many huge mammals existed during the last ice age, some of them 10 times the size of their surviving relatives that we are familiar with today. For example, the Pleistocene giant beaver is estimated to have weighed 700 pounds, while its modern cousin is not known to attain more than 70 pounds in weight. Sightings of giant beavers persist to this day in the folklore of Canadian tribes, including a river in Labrador that has a native Montagnais-Naskapi name that translates as "Giant Beaver River." Among the reptiles, there were many giants that survived long enough that early humans surely saw such creatures, including giant turtles the size of cars and giant lizards truly deserving of the label "dragon." The largest flying birds we know of are the presumably extinct teratorns, with 25-foot wingspans. Some researchers in the field of cryptozoology think that these birds still survive, or survived until recently, as suggested by legends and sightings of the Old World roc and the New World thunderbird. Giant animals of cryptozoology fall into several categories. Sometimes, it is thought that the animals are probably members of a known species, but that the accepted upper size limit for that species needs to be increased. This is especially true in the case of some reptiles and invertebrates, who grow slowly throughout their adult lives and thus it is conceivable that very old individuals might be quite massive. Sometimes this argument is used to support very weird ideas, such as the concept that there might be giant slugs out there the size of ships, who are merely overgrown representatives of a known species, not a new species. Other times, it is thought that the sightings of a particular giant animal represent a new species. For example, if giant monkeys turn out to be real, it is hard to imagine that they'd just be extra-large individuals belonging to any known species. In the last category, there are creatures that hardly anyone expects to be real, simply because their reported size is so extremely huge that these reports smack of mythology, not biology. It is still possible that some of these could be real, especially if the witnesses badly misjudged the size, but these truly colossal giant animals are usually studied by folklorists, not cryptozoologists. Generally, the more acceptable super-large giant animals are those native to the sea, because even mainstream scientists still expect that we have yet to discover some deep-water oceanic giants. Some giant animals are possibly just mislocated. A creature that likely fits in this category is the giant armadillo of Florida, which reportedly reaches 5 feet in length. This creature sounds quite similar to the South American giant armadillo, a living species that reaches at least 4 feet, 10 inches in length. Perhaps some pets were dumped and created a feral population. There are reports of horse-sized pangolins (an animal resembling armadillos but not related to them) coming from Rintja, one of the Lesser Sunda Islands of Indonesia. This giant pangolin is known locally as the veo.The largest known pangolin lives in Africa and can reach 5 feet in length. There is reason to believe that giant pangolins could survive on some Indonesian islands, because we have fossil remains from nearby islands of 9-foot pangolins that supposedly died out about 10,000 years ago. Furthermore, Indonesia is one of just a few hot spots for cryptozoology, where new animals are still getting discovered and accepted by mainstream science on a regular basis. 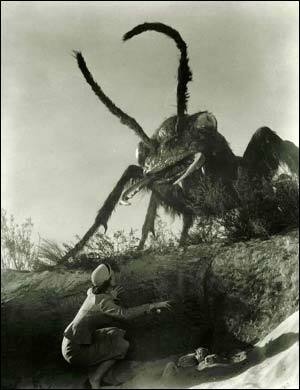 Giant bugs inspire people with particular terror, and are thus a common theme in horror films. Some giant bugs might be perfectly real, if the investigations of cryptozoologists pan out. Giant ants, the size of foxes, have been reported from India and from remote areas of China. Giant earwigs, more than twice the size of ordinary earwigs, were discovered on the island of St. Helena in the eighteenth century, but then seemingly went extinct. They have been sighted occasionally during the twentieth century, including the recovery of partial bodies, but their present status is a mystery. Giant earthworms are reported from South America, leaving puzzling tunnels that suggest they are ten or more feet in diameter. Local lore claims lengths of up to 160 feet. Giant marine worms have been sighted lurking in coral reefs near St. Lucia, and several partial bodies have not been identified as any known species, yet they have not been classified as a new species either. Spiders the size of small dogs have been reported from rain forests in both Africa and Papua New Guinea. A great number of these giant beasts are not important enough to warrant their own individual sections in The Cryptid Zoo, but you can read about some of the less common types, such as giant frogs, giant bushbabies, surviving Irish elk and Bergman's bear, by perusing the list of sources at the bottom of this page. Ellis, Richard. The Search for the Giant Squid. Griggs, Kim. Giant Octopus Puzzles Scientists. Izzard, Ralph. The Hunt for the Buru. Markle, Sandra. Outside and Inside Giant Squid. Owen, James. Holy Squid! Photos Offer First Glimpse of Live Deep-Sea Giant. Renz, Mark. Megalodon: Hunting the Hunter. The text on this page is copyright 2007-2010 by Jamie Hall. Please use proper citation if you are using this website for research. See this page's history on the Wayback Machine.